* BURMA (Myanmar) (RLPB 267), where an anti-conversion law is being drafted that could put those seeking to change their religion, as well as those spreading non-Buddhist religion, at risk of imprisonment. * INDONESIA (RLPB 268), where reformist leaders have historically faced serious resistance from powerful forces, specifically Islamic fundamentalists and military elites whose interests lie in preserving the status quo. In October Joko Widodo (Jokowi) will be inaugurated as President of Indonesia. Jokowi may prove to be more sensitive than previous presidents to issues of religious freedom and minority rights. As Governor of Jakarta, Jokowi's deputy was Basuki Tjahaja Purnama (Ahok), a Chinese-Indonesian Christian. Together they were known as team 'Jokohok', and their willingness to tackle Jakarta's systemic problems made them extremely popular. Ahok will now ascend to the position of Governor of Jakarta, something the Islamic Defenders Front (FPI) have opposed from the beginning and are vowing to resist. According to Jakarta City Council regulations, the Governor of Jakarta is also chief patron or chairman of eight Islamic bodies. Pray for Indonesia, and that God will use Jokowi and Ahok for his purpose. May God frustrate the schemes of the wicked (Psalm 146:9). * SUDAN & SOUTH SUDAN (RLPB 269), where, because of Islamisation and persecution in Sudan and civil conflict and famine in South Sudan, the Church's suffering seems never-ending. 'In answer to the prayers of many' (2 Corinthians 1:11), Meriam Ibrahim is now safe and free. Meriam, along with her husband Daniel and their two children Martin and Maya flew into Rome on Thursday 24 July, in an Italian government plane, accompanied by Italy's vice minister for foreign affairs, Lapo Pistelli. They were greeted at the airport by Italian Prime Minister Matteo Renzi. The family subsequently enjoyed a private audience with Pope Francis, who thanked Meriam for her 'courageous witness to perseverance in the faith', in the face of possible death. The family will soon fly to the US where they start a new life close to Daniel's extended family. Sudan may now be less willing to have apostasy dealt with through the courts, preferring instead to leave Sharia implementation in the hands of vigilantes. What will not change is the fact that Islam demands death for apostasy. Please remember Faiza Abdalla (37) who is facing the same fate that Meriam had faced: lashes for adultery and death for apostasy, only without her husband, who fled from persecution to South Sudan some time ago [see RLPB 266 (June update)]. * INDIA (RLPB 270), where more than 50 rural villages in the northern state of Chhattisgarh, have followed the advice of Hindu nationalists to ban all non-Hindu religious practice by exploiting a law that facilitates rural self-governance. Christians are being attacked and denied food rations and water. As every level of government in Chhattisgarh is Hindu nationalist, the situation appears hopeless. Pray that God will intervene for these faithful believers and that this will not create a precedent that will spread around the nation. Pray for India, and that Western nations might care as much about Indian lives as they do about making money using cheap Indian labour. On Wednesday 23 July, at the end of a three-day regional summit in Brazzaville, Congo, leaders representing Seleka and Anti-Balaka forces signed a cease-fire. In reality, the deal is next to meaningless. Not only is it unenforceable, but each side is profoundly splintered and the representatives at the talks did not represent all the factions. Critically, the sides did not manage to agree on a disarmament process. The talks were nearly derailed when the Seleka representative Mohamed Dhaffane demanded the partition of CAR. Only after serious pressure did Dhaffane back down, drop the demand and sign the cease-fire. The next day however, Seleka military chief Maj-Gen Joseph Zoundeiko denounced the deal saying his forces would ignore the cease-fire and continue to fight for CAR's partition. Pray for the Church in CAR. In their continuing efforts to de-Christianise the Zhejiang skyline, officials have removed more crosses from the tops of churches. Early Monday 28 July a crane arrived at Longgang Huai En Church in the city of Wenzhou and removed the cross. Since the campaign started in January 2014, at least 130 churches have been impacted, mostly through the removal of their crosses, but some through the demolition of their entire property. On 21 July thousands of Christians rallied to prevent the demolition of Kau Yan church in Wenzhou. 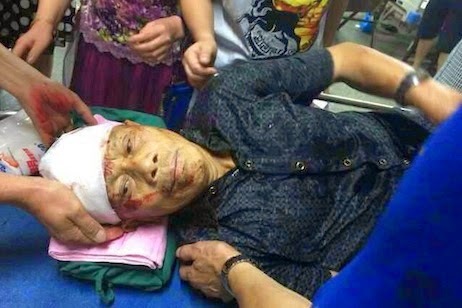 Police beat their way through the protesters, leaving dozens wounded and many requiring hospitalisation (photo). The protest was successful (for the time being) as the demolition crew ultimately did withdraw. Pray for China, and for the Church in Wenzhou. Formerly home to the highest concentration of Christians in Iraq, Mosul, the provincial capital of Nineveh, the ancient historic homeland of the Assyrian nation, is now devoid of Christians. 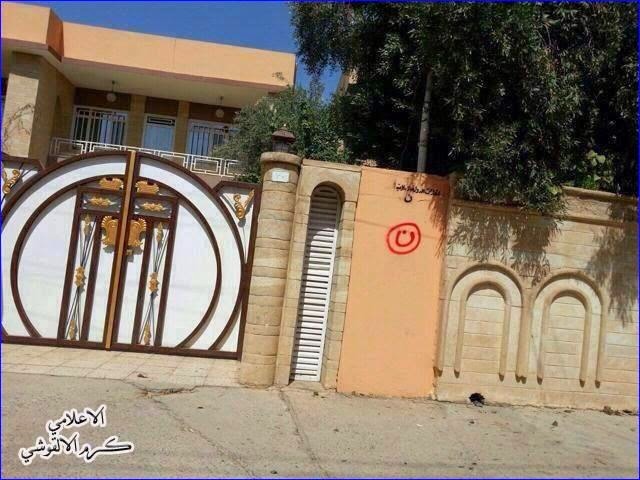 As the last Christians left, ISIS marked their homes with a large red Arabic letter 'n' for 'Nasrani' (the Arabic word for Christian), indicating that their homes were to be forfeit to the Islamic State. The fleeing Christians were met at checkpoints by ISIS militants who took their phones, passports, cash and jewellery -- everything but the clothes on their backs. Most of the displaced Christians are now in Kurdistan, being cared for by local churches. The time has surely come for the West to share this burden of care. Western churches should start giving sacrificially to organisations that can get aid to displaced believers and the churches that care for them. Above all, PRAY. Meanwhile back in Mosul, ISIS is busy destroying the city's cultural heritage. On 4 July ISIS fighters dug up what is purported to be the tomb of Jonah. They also torched 11 of the more than 35 churches and monasteries scattered throughout the city, and demolished statues of literary and historic figures. Three Sunni clerics who tried to resist ISIS were executed. On 24 July ISIS militants returned to the Prophet Younis [Jonah] Mosque, and used explosives to complete the demolition. Muslims who protested the bombing were arrested and summarily flogged. A pastor from Northern Iraq has reported (with photographic evidence) that in al-Raqqa, Syria some time ago, eight young men were publicly beheaded allegedly after being accused of being apostate converts to Christianity. The eight heads were then suspended from an overhead powerline. 'Please pray for us,' he said. Predominantly Eastern Orthodox Macedonia is 25 percent ethnic Albanian and 33 percent Muslim. Tensions soared in Macedonia through July after a Skopje court issued its judgment against seven ethnic Albanian Islamists charged with murdering five Macedonians in April 2012. The Islamists, all advocates of a Greater Albania, were charged with killing four young 'Christian fisherman' at Smilkovci Lake on Good Friday 2012, before killing a witness. When they were arrested in 2012 'about 1,500 radical Islamists' protested in Skopje, demanding their release, calling for a Greater Albania and chanting Islamist slogans including 'Allahu Akbar' and 'Death to Christians'. On 30 June 2014 the court sentenced six of the ethnic Albanian Islamists to life in prison. 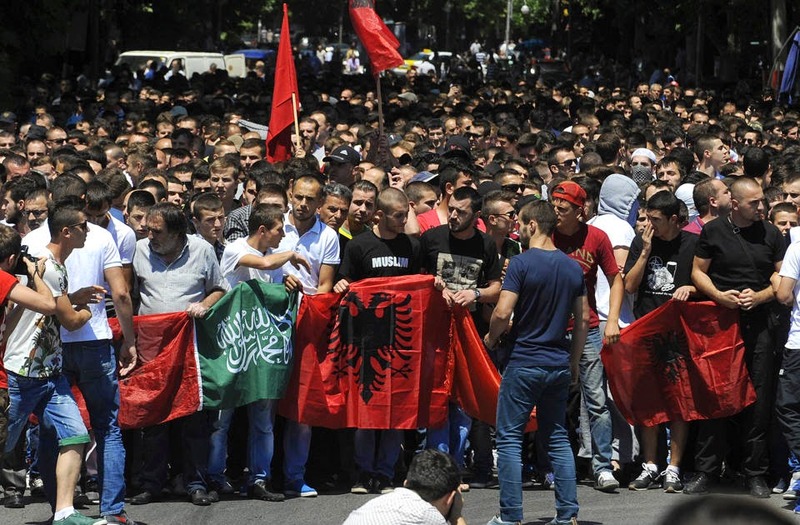 The following Friday (4 July) some 2000 Muslims, many carrying Albanian and Saudi flags, clashed with police in Skopje with 20 police injured. A planned counter-demonstration by ethnic Macedonians failed to materialise. Ethnic Albanian Muslims demonstrated again the next Friday 11 July, chanting 'UCK' (Ushtria Clirimtare Kombetare / National Liberation Army). [The UCK is the Albanian guerrilla force that fought the Macedonia Armed Forces in 2001.] The situation in Macedonia is volatile. Albanian security expert Ilir Kulla estimates that thousands of ethnic Albanian Muslims from across the Balkans have received military training with al-Qaeda in Syria. Furthermore, they are returning with plans for an 'Albanian Caliphate'. Pray for the Church in Macedonia. Located in north India's tribal belt, the Indian State of Chhattisgarh has long been a focus of Hindu nationalists' determined effort to secure the allegiance of tribal Indians. The Vishwa Hindu Parishad (VHP) is the 'cultural wing' of the Sangh Parivar, the Hindu nationalist umbrella body. Along with organising Hindu festivals and facilitating the 'safronisation' of Indian media and education, the VHP also conducts Hindutva (Hindu nationalist) missionary work amongst the tribals. This missionary work includes the 'ghar vapsi' (home-coming) campaigns in which thousands of tribal Christians are coerced and even forced to convert to Hinduism. In early May Hindus in Sirisguda village in Chhattisgarh's Bastar region complained to the VHP that Christians had refused to donate money to the annual Hindu festival and had used 'derogatory language against the Hindu deities and customs'. The VHP pointed the Sirisguda Hindus to Section 129 (G) of the Chhattisgarh Panchayat Raj Act which facilitates rural self government by empowering 'gram sabhas' (village assemblies) to issue rulings for local implementation. Subsequently the Sirisguda gram sabha issued a ruling banning all non-Hindu religious practice in the village. Since then, more than 50 villages in Chhattisgarh's Bastar region have followed suit and used the Act to ban non-Hindu practice. Even though the rulings are contrary to the Indian Constitution, the VHP has said it will lobby the Chief Minister Raman Singh and Governor Balramji Dass Tandon (both of whom are Hindu nationalists) to ensure the bans are imposed. Effectively these gram sabha rulings legitimise communal hostility towards Christians; consequently serious persecution is escalating. There have been numerous reports of Christians being violently attacked, refused access to amenities (particularly water) and denied food rations. Sonuru Mandavi's family converted to Christianity in 2002. She told India's The Hindu that the Christians in her village have been unable to collect rations for over two months and when they tried to collect them they were physically attacked. The only alternative is to pay full price in retail stores, something these Christians cannot afford due to the systematic discrimination they have long suffered. Economic interests might also play a role. Multi-national mining corporations have interests in mineral-rich Bastar and a community at war with itself cannot make a united stand against them or the [often corrupt] government bodies with which the corporations deal. Christian leaders are concerned that tribal Christians are being bullied out of their homes and off their lands by Hindu elites and petty criminals who have conspired to seize their property so they can claim the compensation when the multi-nationals acquire the land. Numerous Christian leaders and religious liberty advocates are warning that if these ruling are allowed to stand and if impunity persists, then a new wave of Hindutva inspired, VHP incited, violent anti-Christian pogroms may be imminent. The danger is that the government will re-interpret the religious liberty provisions in the Constitution, so as to kill the spirit of the Constitution while retaining its words (thereby avoiding the need for a referendum). How this crisis is resolved will say much about the future direction, not only of Chhattisgarh, but of India under Hindu nationalist BJP rule. * intervene in Chhattisgarh's Bastar region to protect and provide for poor tribal Christians who are being persecuted for their faith. * sharpen the consciences of local Hindus, so they will resist the pressure to persecute their Christian neighbours. * raise up voices for liberty, justice and harmony across India; may he magnify those voices, in the media, in the judiciary, in politics, in education, as they defend the spirit of the Indian Constitution and defend religious freedom. * raise up voices outside India that will speak out for genuine religious freedom, security and justice inside India; may he magnify those voices, in media, international politics, diplomacy, advocacy and in the Church worldwide, as they speak up for those who cannot speak for themselves. Since mid-May over 50 villages in Chhattisgarh's Bastar region have followed the advice of the Hindu nationalist VHP and used the Chhattisgarh Panchayat Raj Act to ban all non-Hindu religious practice. As Christian leaders note, these rulings are contrary to the Indian Constitution. Despite this, the VHP has said it will lobby the authorities to ensure the bans are imposed. Persecution has escalated, with numerous reports of violence and social boycotts whereby Christians are being denied access to water and food rations. The Chhattisgarh Christian Forum has requested that the Panchayat Raj Act (which facilitates rural self-government) be scrapped and is threatening to take the authorities to court if they do not act. They fear that persecution could escalate into anti-Christian pogroms. Please pray for India and its Church. On 17 February 2014 Sudanese authorities demolished a Sudanese Church of Christ building in the Ombada area of Omdurman (near Khartoum) and confiscated the land, all without prior notice. According to Morning Star News (20 February) the only reason the government gave for the demolition was that the church was in a Muslim area and was not wanted there. The church's 300 or so members were mostly from the Nuba Mountains in Sudan's volatile 'new south'. The secretary-general of the Sudan Council of Churches, Rev Kori El Ramli, recently told the BBC that town planners are now forcibly relocating Christians out of the area, moving them to a district north of the city where there is no church. Back in April 2013, the Government of Sudan (GoS) decreed that no more building permits would be issued for Christian churches, meaning these believers will not be able to rebuild. On Sunday 29 June authorities delivered a letter to the Sudanese Church of Christ at El Izba residential area in Khartoum North, warning them that their church building had been listed for demolition. About 10 am the next day, a force of about 70 uniformed and plain-clothed officers reduced the church (built in 1983) to rubble. The Sudan Council of Churches protested and on 12 July, a minister of Guidance and Endowments, Shalil Abdullah, responded saying that the remaining churches were enough for those Christians who had stayed in Sudan. Ramli disagrees: 'We are growing,' he said, 'we need more churches.' Many believe the persecution is part of a systematic campaign to drive Christians out of Sudan. Meanwhile, Meriam Ibrahim [RLPB 261 (21 May 2014)], her husband Daniel and their two children, Martin and Maya are still in the US Embassy in Khartoum. Meriam's Muslim relatives want to appeal the ruling which saw Meriam's sentence of death for apostasy overturned. Furthermore, Sudanese authorities have charged Meriam with falsifying documents, after she attempted to leave the country on South Sudanese papers. The US State Department says it is working to get the family out of the country, three years after Daniel (a US citizen) first started petitioning the US for a spousal visa for his Christian wife. In seven months of civil war over 10,000 have been killed and some 1.5 million displaced. At least 4 million South Sudanese citizens are now facing the prospect of famine. 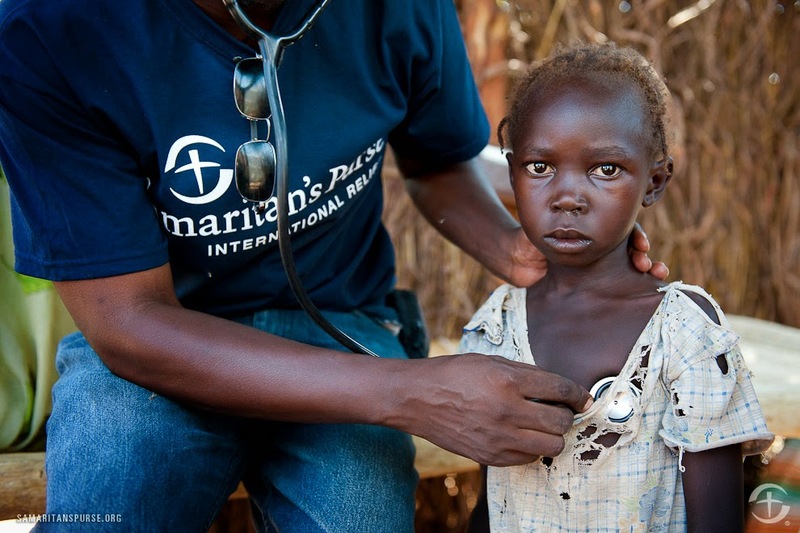 Doctors without Borders (MSF) warns that with severe malnutrition already widespread, the coming months will be dire. The rainy season has started, the roads are closed and because there was no planting (due to conflict) there will be no harvest. Displaced South Sudanese and Nuba refugees from Sudan living in massively overcrowded, unsanitary camps are dying of malaria, respiratory tract infections and other preventable diseases. 'The South Sudanese population is living on a knife-edge,' says MSF (14 July). According to Sudan's President Bashir, several Western countries are now secretly calling for Sudan's reunification. Whilst this is doubtless nothing more than propaganda, it does provide an ominous insight into the thinking in Khartoum. The question is now: Where do we go from here? * intervene in South Sudan to bring an end to the corruption and tribalism that has merely taken the place of Islamic jihad. May hope be restored; may the Church's suffering come to an end; may God be glorified. 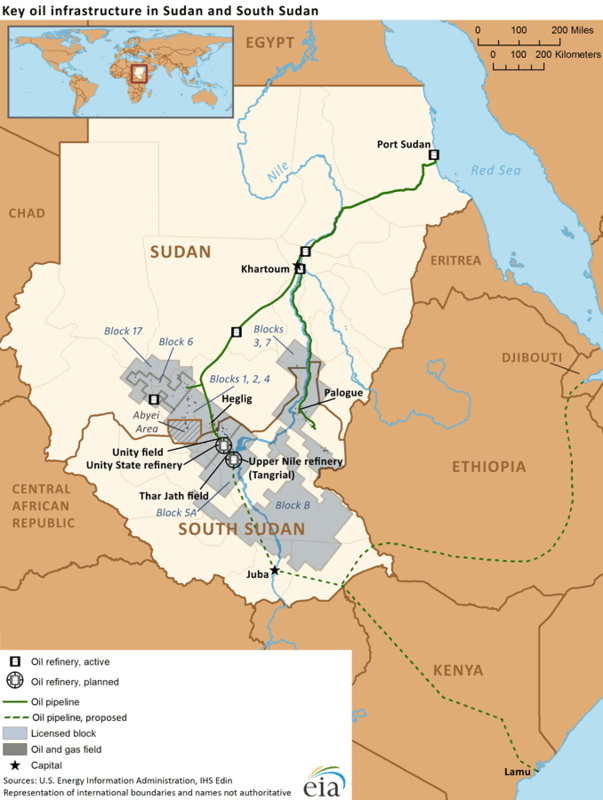 South Sudan declared independence from Sudan on 9 July 2011. Three years on, Sudan is pursuing Islamisation and ethnic-religious cleansing, while South Sudan has descended into chaos and civil war. In Sudan, churches are being demolished as part of a systematic campaign of persecution aimed at driving Christians out of Sudan. In South Sudan, progress has been crippled by corruption and conflict. Some 1.5 million South Sudanese are displaced, living along with Nuba refugees from Sudan in seriously over-crowded, disease-ridden camps. Some four million are facing famine. The rainy season has started, the roads are closed and because there was no planting there will be no harvest. Please remember the Church in Sudan and South Sudan, praying for wisdom for her leaders and that God the Redeemer will intervene. Indonesians go to the polls today (Wednesday 9 July) to elect a new president. After 14 years of heartbreak, Papua's long-suffering predominantly Christian ethnic Melanesians are yearning for change. During Suharto's 32-year 'New Order' dictatorship, a brilliant and highly cultured Muslim cleric by the name of Abdurrahman Wahid (1940-2009) rose to prominence as a staunch defender of human rights, ethnic-religious minorities and Indonesia's secular tradition. In 1999 he became Indonesia's first democratically elected president. Wahid embarked on a program of ambitious, radical reforms. His commitment to military reform enraged not only the Indonesian military (TNI) but all the corrupt business and political elites who had long reaped financial gain from TNI business. During 2000 Wahid commenced work on a Special Autonomy Law for Papua. Created in consultation with Papuans, it mandated (amongst other things) that most of the revenue earned from Papuan resources would be returned to Papua to improve health, education and other services. Enraged, the TNI (which is heavily invested in Papua) accused Wahid of supporting separatism, evoking the memory of East Timor. Indonesia's Islamic fundamentalists were also anti-Wahid, for not only did he seek to protect the rights of Christians, he openly supported Israel. Unfortunately, Wahid was also disorganised and unpredictable with a knack for alienating colleagues. By 2000 powerful forces were aligning against him, conspiring to have him impeached. Violence soared, especially in Maluku where the TNI was openly arming and supporting the Laskar Jihad and in Papua where the TNI was provoking 'incidents' so it could claim to be fighting 'separatism'. Terrorism escalated and the nation seemed to be wracked by insecurity. After Wahid was impeached on 23 July 2001, his successor, Megawati Sukarnoputri, set about emasculating the Special Autonomy Law. Megawati's term was followed up by two terms of Susilo Bambang Yudhoyono (SBY), during which nothing was done to restore the confidence of the Papuans. Javanese-Muslim colonisation, militarisation and Islamisation proceeded apace, along with poverty, marginalisation, corruption and gross human rights abuses. Papuan hope faded until eventually, Special Autonomy was declared dead, replaced by a revived yearning for independence. [Indonesia will not allow independence as Papua is simply too resource rich.] During 2013, in a last bid effort to secure a legacy, SBY engaged with Papuan governors to hammer out a new Special Autonomy law: 'Otsus Plus'. SBY had hoped to have it enacted by August 2014 before his term expires in October 2014. However, the situation is far too complex for that, especially after decades of betrayal, neglect, persecution and serious, systematic human rights abuses inspired by greed and ethnic-religious hatred. Papua's predominantly Christian, indigenous Papuans desperately need change. However, it is highly unlikely that Islamists or the TNI or all the corrupt business and political elites who reap financial gain from Islamist and TNI business in Papua will simply give up their ambitions and economic rewards for the sake of those widely regarded as 'black infidels'. If change is to come to Papua, it will require profound conviction and commitment in Jakarta backed (or even generated) by a profoundly convicted and committed 'international community'. As in 2000, any reform will face considerable opposition. * flood Papua's civic and religious Christian leaders with divine wisdom, strength and grace, to lead the people according to God's will. * intervene in Indonesia, in Papua, to change the situation radically -- to 'turn back the battle'. As Indonesians elect a new president, Papua's long-suffering, predominantly Christian, indigenous ethnic Melanesians are desperate for change. They have suffered decades of Javanese-Muslim colonisation, militarisation, Islamisation and systematic human rights abuses. Together with poverty, neglect and marginalisation, the situation facing indigenous Papuans is dire. It is certain that any attempted reform in Papua will be opposed fiercely by Islamists and the Indonesian military (TNI), along with the corrupt business and political elites who reap financial gain from Islamist and TNI business in Papua. However, we can be certain also that, without reform, the genocide of Papua's indigenous peoples is within sight. Pray that the 'international community' -- and particularly the Church -- will commit to supporting reform in Papua. Please pray for the Papuan Church, and for God to intervene in Papua. On 27 May the Burmese government published its proposed Religious Conversion Law in the state-owned newspapers, along with an appeal for input from citizens by 20 June. However, the government gave citizens only a fax number, very few Burmese citizens have a fax. Despite this, a debate over religious freedom is heating up, thanks primarily to the efforts of independent media, bloggers and civil society groups. The Religious Conversion Law is one of four laws packaged under the Race and Religion Protection Bill, introduced by the Ministry of Religious Affairs which, according to its website, is committed openly to the 'purification, perpetuation, promotion and propagation of the Theravada Buddhist Sasana [religious doctrine]'. The Race and Religion Protection Bill, which targets religious conversion, inter-marriage, polygamy and birth rate, is the result of lobbying by the Buddhist nationalist monks of 'Mabatha', the Committee for the Protection of Nationality and Religion. [See RLPB 253, March Update, for background.] A drafting committee will now consider citizens' responses before submitting a final draft to the parliament. A parliamentary vote is expected before the end of 2014. The proposed Religious Conversion Law mandates that Burmese residents may not convert to another religion unless they first obtain a permit. Boards will be established at the town level, empowered to scrutinise all requests and issue or deny permits. The issue is especially serious because in Burma a person's religion is registered and appears on their official Identity Card and this in turn determines their rights. Human Rights Asia reports: 'Under section 3 of the draft law, the inquisitorial boards will consist, at the township level, of the head of religious affairs (chairperson), the head of the national registration department (deputy chairperson), the deputy administrator of the township and a person of his choice, the chairperson of the women's affairs federation, and a member of the education department. Under section 7(a) at least four of these persons form a quorum with which to interrogate someone seeking to convert her or his religion.' Section 7(b) mandates that the interrogation shall take place within 90 days of an application. 'Following this inquisition, the board will either issue or deny a permit with which to convert.' Furthermore, anybody applying to convert 'with the intention of insulting or destroying a religion' could be jailed for up to two years. And, in terms reminiscent of other South Asian anti-conversion laws, people who 'compel' others to convert through 'undue influence or pressure' would be liable to one year in jail. * redeem this stressful situation and use it to awaken many to the great value and importance of religious freedom and to the wisdom and truth of the Gospel of Jesus Christ. * bless, strengthen, protect and provide for Chin leaders as they lead the way through prayer, advocacy and their voice in parliament. * raise up and magnify many more voices for liberty; may those promoting Buddhist nationalism and fear not control the debate. * raise up many more workers for his harvest field (Matthew 9:37-38); may Burma's diverse peoples find peace through Jesus Christ. For Christ Jesus is our peace, for he makes us one, breaking down in his flesh the dividing wall of hostility ... reconciling us to God in one body through the cross, thereby killing the hostility (Ephesians 2:13-16 excerpts, paraphrased). As the government's drafting committee finalises Burma's Religious Conversion Bill, a debate is heating up over the value of religious liberty. Leading the Buddhist nationalist cause and championing repression are various groups of Buddhist nationalist monks, particularly 'Mabatha' and '969' along with various Buddhist elites and many MPs. Leading the fight for liberty are pro-democracy bloggers, independent media, religious minorities and human rights organisations, particularly the (Christian) Chin Human Rights Organization (CHRO). The bill is part of a four-law package aimed at protecting and promoting Burma's Buddhist identity. If enacted, the law would effectively prevent conversions and criminalise witness and evangelism. The Chin National Democratic Party has declared its vigorous opposition to the law as being 'simply unacceptable' in a multi-faith, multi-ethnic country. Please pray for Burma and its Church.